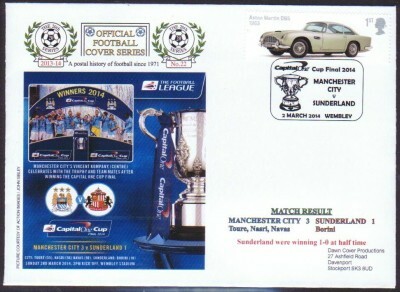 This is one of three covers issued for The Capital One Cup Final 2014 between Manchester City and Sunderland. This cover shows the match result and City winning the trophy. The other two covers No.2020 (Man City) and 2021 (Sunderland) show how each club won through to the finals. All priced at £6 initially although fewer were produced for No.2020 and 2021. Each cover contains an informative filler card printed in colour.